This is a small test before starting working on something more robust for event growth tracking. 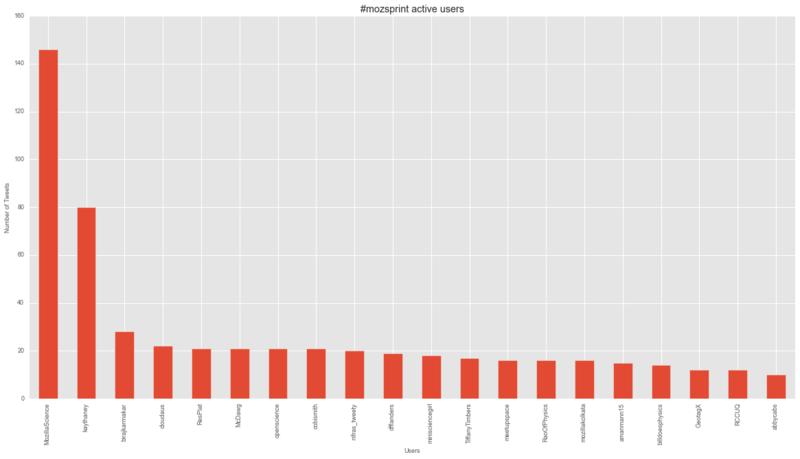 I wanted to play with the data generated by the #mozsprint hackathon organized by Mozilla Science Lab. 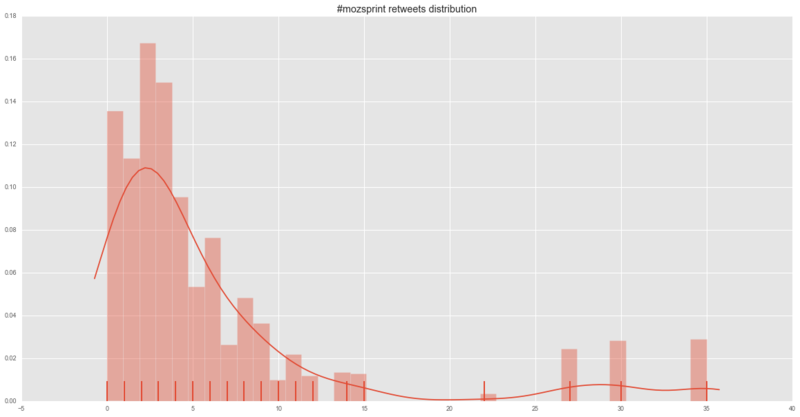 When it comes to an event like #mozsprint, it is hard to get realtime feedback about its growth unless it is big enough to be discussed and debated in a social network such twitter. 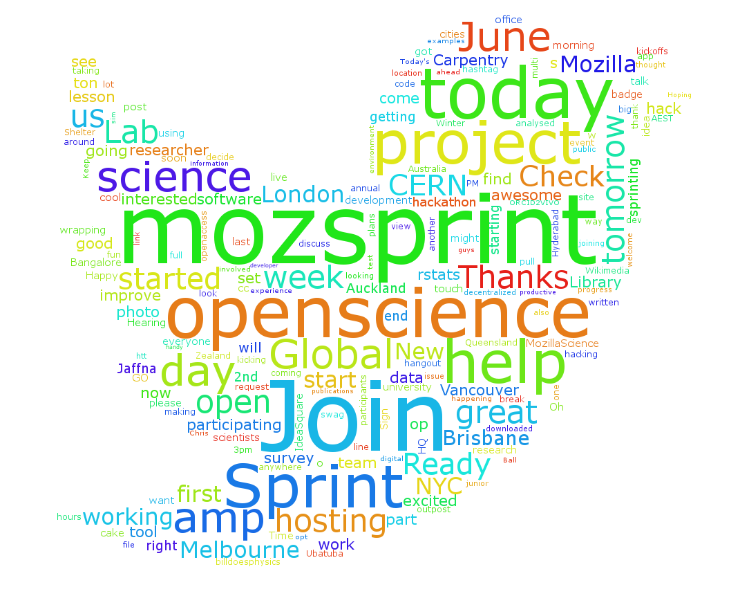 The Mozilla Science team did an amazing job to prepare for the #mozsprint by making a lot of people involved all over the world, which results in a considerable amount of tweets (data) that one can extract and play with to see the event itself from different angles. Libraries used here are classic, like pandas to store extracted information into dataframe, matplotlib and seaborn to plot the data we need, etc..
Because we are using tweepy, and if you go to their official documentation, you will learn that you need to create an app first related to your twitter account on the apps.twitter.com website. Once you create the application that will be used with your code, you will be given a set of tokens and secret code that you need to provide to your code here in order to connect to the twitter API, I will put the ones I used myself at the time of this tutorial writing, just to get an idea on how these tokens look like, but by the time you read this, these will no longer be useful. You will notice the wait_on_rate_limit=True this is to tell your program to not return the 402 error code from twitter and to wait the needed time in order to resume the task. Now we will initialise an empty list called mozsprint_data this will contain the returned results as json objects, each list element will be basically a json format of a tweet with all the information. # If available, where was the tweet sent from ? Awesome, it looks like a table we can use now. You will notice that some tweets start with RT which is a retweet, so this may create a bias if we want to now the number of original tweets and the number of retweets. 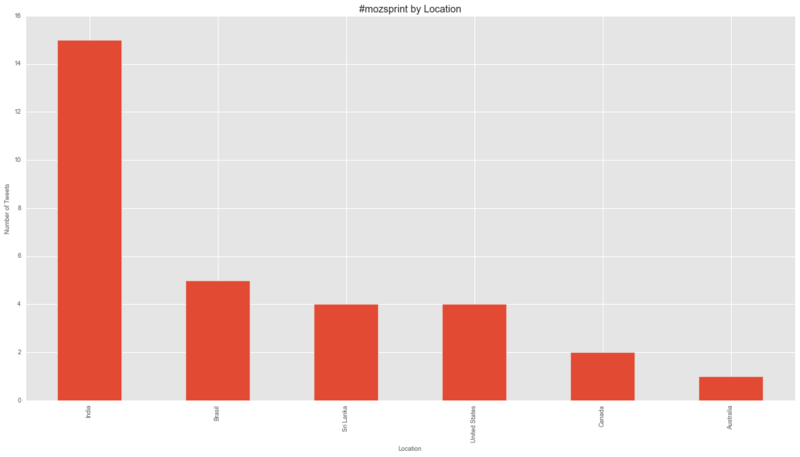 :param category: Category plotted, can be tweets users, tweets language, tweets country etc ..
Now, who is the most engaged on twitter for the mozsprint ? Of course ! @MozillaScience was very active followed by @kaythaney (Kaitlin Thaney is the director of MSL :) ), well it seems like it make sense, this is great. Note here that we are not counting usernames in the tweet texts, we are playing with the users column in our tweet dataframe. :param category: Category plotted, can be users, language, country etc ..
distplot provides one interface for plotting histograms, kernel density plots, rug plots, and plotting fitted probability distributions. distplot tries to use a good number of bins for the dataset you have, although all of the options for specifying bins in hist can be used. In fact, first day of the hackathon was the peak, but we can observe a plateau before the mozsprint starts, that means two things, the event was successfully planned and announced, and the peak is a translation of how much viral it went. Very good job Mozilla Science Team ! 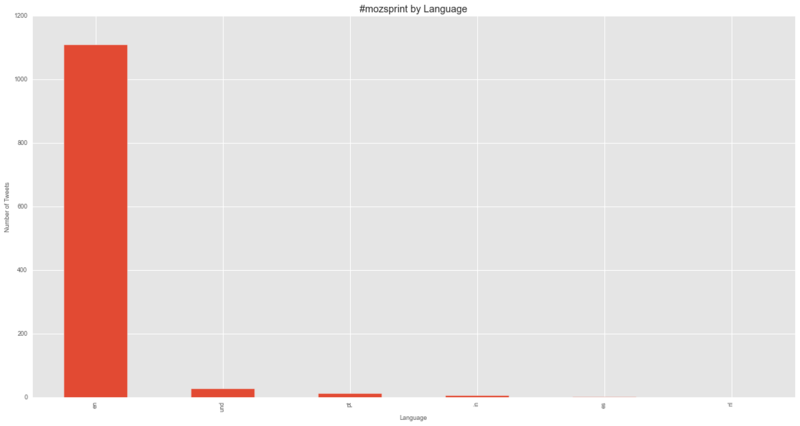 Like any event, we are always curious about that number of words that gravitates around a topic, when mozsprint started, you can observe a whole bunch of tweets and other hashtags as well as recurrent terms. 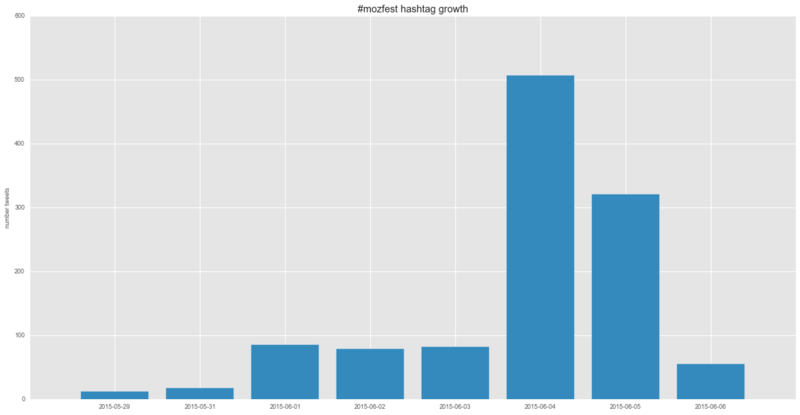 In order to see if there is a correlation between these words and the current topic, we can follow several approoaches, one of these is to extract all tweets text and proceed with a textmining technique to classify words by category or by context. But as a closing note to this notebook I wanted to do something lighter, word cloud. Simple, clear and speaks for itself. So let's create one. We are lucky because there is a library just for that. We will remove all retweets prefixes like RT or username mention or http etc ..